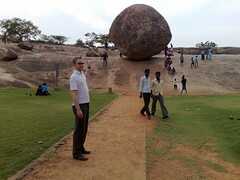 One of the favourite sights ever when travelling abroad was in India - Krishna's Butterball, - a chuffing huge rock which is seemingly ready to roll down a hill and crush people. When I was in Dorset the other day I saw a guy doing stone balancing on the beach, and it reminded me of it... but on a slightly smaller scale! Balancing rocks make nice pictures as you'll see if you look at his website. I would have bought one if I had me own flat to put it up in. I read somewhere in a comment you left the message "I don't need my blog to be popular, but I'd like someone to read it!" and I totally agree so I gave your blog a look! Stone balancing is really cool. All over the rocky beaches in Hawaii you'll see stones people have previously balanced, it's very neat to see. Amazing. I have never seen this before. I too read that you'd like someone to read your blog, so I checked it out. And as for the acupuncture, I think it's best to do your research and find a good, cos' when the doctor is experienced it works great! But if they don't know what they're doing, it's potentially dangerous. Do hope your knee gets better.